Our neighbors in Hamilton, Wenham, Manchester, Essex, Rowley, Middleton, Gloucester, Rockport, Newburyport, and Peabody have all adopted the Community Preservation Act. A contaminated 1.3 acre parcel in downtown Peabody is slated to become a park as part of the city's Riverwalk plan, which is also designed to spur economic growth. From brownfield to play ground, CPA is helping to make it happen. CPA funded repairs to public dock. Program to preserve and restrore historic streetscapes through planting of more than 165 trees. The project, managed by the Newburyport Tree Committee, also involved a survey of existing street treets in the city and evaluation of condition. The Old Hill Burying Ground (1729) is an important landmark in Newburyport and the final resting place of early American bridge builders, clock and cabinet makers, lawyers, merchants, sea captains, and revolutionary soldiers. Gravestones within Old Hill Burying Ground have fallen into disrepair due to weather, erosion, vandalism, and/or lawnmowers. The appropriation provides necessary restoration and repair services and materials, in addition to professional training from a stone conservator for city employees and interested volunteers to participate in the ongoing preservation efforts. As of July 2011, 475 gravestones have been restored. For the preservation and restoration of historic city maps in 2006. 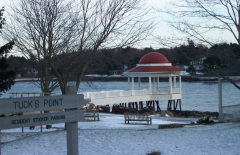 Restoration of Tuck's Point Rotunda, a historic waterfront pavilion used for public recreation. CPA funded design and construction over three phases. Completed in 1871, Gloucester City Hall is the most historically and architecturally significant municipally owned building in Gloucester and is listed on the National Register of Historic Places. Designed by the acclaimed architectural firm of Gridley J. F. Bryant and Louis Rogers, Gloucester City Hall defines the City's skyline, contributes to the architectural fabric of Gloucester, adds vibrancy to downtown, houses municipal treasurers, serves as an important venue for community events and has been the seat of municipal government departments for almost 140 years. As part of the ongoing exterior restoration of Gloucester City Hall, CPA funding will be used to find architectural and engineering plans and to restore and rehabilitate the rapidly deteriorating elements of the building's exterior envelope, including the balance of the tower, the ventilators, the decorative cornice, the windows and the entrance porticos. To help Harborlight Community Partners purchase, restore, and retain the Pigeon Cove Ledges as affordable housing for senior residents. A historic school converted to elderly housing in 1975 was in need of rehabilitation. CPA funds combined with grants and other funding to update and rehabilitate 80 affordable housing units. Total project cost is $17.6 million. CPA funded the purchase and sensitive conservation and partial development of a historic farm property. The project spans all four CPA categories - historic preservation, affordable housing, recreation and open space.